The KSB Group has expanded its portfolio in 2018 by adding a comprehensive range of vertical turbine pumps. 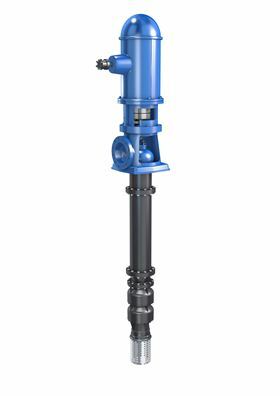 The B Pumps are multistage vertical turbine pumps with a submerged hydraulic system. The pump sets comprise a discharge casing assembly, a column pipe and a pump bowl assembly. In total, 17 sizes with three different impeller types are now available. The pump sets cover heads of up to 200 m and flow rates of up to 720 l/second. They are available with 1-25 stages, with stage casing diameters ranging from 6-24 inches. Different designs allow either an above-floor or underfloor discharge. B Pumps can be driven by vertically mounted electric motors or via a right-angle gear with a horizontal diesel engine or electric motor. The maximum permissible speed equals 3500 rotations/minute. The pumps are made of grey cast iron and steel or in customised materials. The intermediate bearings of the pump shafts are lubricated by the fluid handled and can be fitted with an external lubrication supply. The maximum temperature of the fluid handled should not exceed 105 °C. The casing is designed for a pressure of 16 bar and the discharge flange dimensions are compliant with DIN, BS and ASME standards.